Urban wildlife has long fascinated many, and the story of Pale Male, the red-tailed hawk, and his mates, is no exception. In Pale Male: Citizen Hawk of New York City, we are treated to a thoughtful story about this high-rise dweller as well as those who watch him, advocate for him and love him. Pale Male’s story is a complex one. As a juvenile, he chose to stay in the Central Park area instead of flying somewhere more wild. After wooing a mate, the pair had some bad luck: their first nest fell apart, and their second nest was sited in an area that had previously been a crow stronghold. When the crows would not stop attacking Pale Male’s mate, she became disoriented enough to fly into a high rise and break a wing, sending her to wildlife rehab in New Jersey. Pale Male and his next mate built their new nest at 927 Fifth Avenue, an exclusive apartment building. This building had an elaborate cornice that the hawks used as the base of a very sound nest. However, the nest (and the eggs within it that failed to hatch) were removed by the building in response to complaints from residents about some of the debris (think sticks, poop and pieces of dead prey animals falling from the 12th floor!). Not only was this disappointing to hawk watchers, but it was a violation of the Migratory Bird Treaty Act (MBTA) and the building was sanctioned by the U.S. Fish and Wildlife Service. The next nest stayed, and Pale Male and his mate raised a family there. The book’s description of the young hawks learning to fly is very sweet. The hawks raised twenty three chicks over the next nine years, proving to skeptics that life in the big city could be very good for hawks! In 2004, the building took down the nest, taking advantage of a modification to enforcement of the MBTA that stated nests could be destroyed as long as no eggs were present. An international outcry ensued, complete with signs, chanting and protesters in hawk suits. The building owners eventually reinstalled infrastructure to allow the hawks to rebuild their nest, which they began to do within minutes. Now, one of Pale Male’s sons, Junior, lives across the park with his mate. This is a wonderful book for early elementary kids or any adult who has an interest in urban wildlife, the zaniness of life in Manhattan or the power of advocacy. 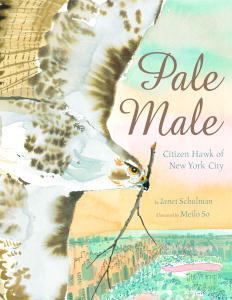 We especially appreciated the way that author Janet Schulman wove together the facts into a compelling story while illustrator Meilo So’s fresh, colorful depictions of Manhattan and Pale Male mesh with the tale.